Things Fall Apart is the most famous African novel. It’s easy to expect it to give an unfamiliar portrait of an African society. Hopefully, it will be one that hasn’t been ‘Westernized’, and will show us the unique aspects of that society. It should be in-depth, and perhaps by showing the richness of that culture it will tell us how awful racism is, and that ‘black people’ are also people. Achebe did show us that ‘black people’ are also people, but his method wasn’t to turn Igbo society into a tourist attraction. Achebe’s Igbo culture doesn’t come off as very alien and different. That’s because Achebe doesn’t see it that way. If you grew up in Africa, it wouldn’t seem so exotic and odd to you. It would be the norm. Raymond Carver doesn’t treat his middle-class people as an exotic culture, and instead opts to explore the people in it and how they function in it. Achebe does the same thing here. He cares less about showing an exotic society than telling a story about human beings. That’s why Things Fall Apart‘s themes and tropes may seem familiar. Maybe it’s not because White People ruined African culture, because there wasn’t so much difference to begin with. That leaves Achebe exploring his characters, without caging them in their culture. Until the last part, where the White People appear, there’s barely any mention that these characters have dark skin. Instead, Achebe tells their stories dealing with topics such as parenting, childbirth, climbing the social ladder and masculinity. The last one is a big deal. It may be a common theme in a lot of Western literature, but anywhere that there are humans, there will be men and women. It’s a universal theme. Things Fall Apart is actually more of a critique of the concept of gender, rather than embracing masculinity. Okonkwo being a protagonist doesn’t automatically means he’s supposed to be flawless. He’s not Atticus Finch. He’s sexist, but plenty of time that sexism is being challenged. In Igbo society, men are valued much more than women. “Women” is an insult. That’s why Okonkwo can deal with a son that doesn’t fit the traditional male role. He just calls him a woman and that’s it. When Okonkwo has a daughter that is much better than all his sons though, Achebe starts to question the sexism in Igbo society. There’s a whole arc devoted to one female character and her devotion to motherhood. It’s not motherhood that’s been forced about the character. Ekwefi’s love for daughter makes her go against a spiritual custom. This is motherhood by choice. If Ekwefi’s motherhood is just a sign of submission, she wouldn’t have rebelled and went against the gods. However, she made a choice, and put what she loves above what society expects from here. It gets even better when the White Man appears. Achebe’s sympathies may be with the Africans, and there’s no reason to expect anything else. However, it’s not the narrative of noble savages being trampled by the evil conquerer. The White Man doesn’t appear until the last part. 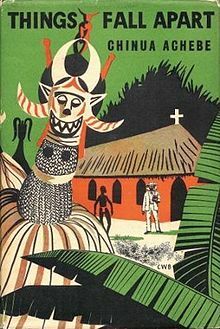 By that time, Achebe lets us get used to the African culture, stop seeing it as exotic and start examining where it falls and succeeds. By the time the White Man comes, Achebe already gets rid of that simple narrative. The part about the invasion is also less about the collision of ‘black’ and ‘white’ cultures. It’s about what happens in general when cultures collide. Just as we tend to view all of Africa as one thing, so do the Igbo view them as just ‘the white man’, although he could have come from anywhere in Europe. When they come, Achebe keeps viewing his own culture with a critical eye. One of the best parts is Nwoye, Okonkwo’s bad son’s arc. The Christians offer a place for the weak to belong to. Igbo culture doesn’t just have outcasts, but is very mean towards them. They flocked to Christianity not just because the White Man conquered by force, but because something was missing in Igbo culture. At the same, Achebe also criticizes the White People for their brutal treatment of Africans. That part is less novel, but that’s just because it’s a well-known story. Achebe criticizes less White People for what they are, but the exact method. White People became a problem not when they built a church, but when they decided that their rules should apply to every single one. It’s the lack of dialogue between the two cultures, the decision to stick to absolute morals that caused the destruction. Once one side decided to use violence instead of dialogue – it’s the White Man in this case – everything spinned out of control. Violence, and being unafraid of it, by the way, is seen as a desirable and masculine trait. Do not get the wrong message, by the way. Things Fall Apart doesn’t say that African culture is obsolete and that the White Man somehow saved them. Rather, Achebe applies the same critical thought that any good author applies to his culture. Things Fall Apart deserves its fame. Maybe, after devling deeper into African literature I will not find this so great. For now, this is the type of novel that deserves to be representative of the continent, if a novel can represent a continent. It doesn’t celebrate its culture and it doesn’t view its history as just bad people doing things. It respects it by treating it with the same critical eye that every other culture deserves. There’s no greater service to a culture than giving it an honest examination, not flinching from its flaws and successes. Some will think the familiarity is because Achebe is also a victim of Westernization, but perhaps ‘black’ and ‘white’ people are more alike than we think. Maybe, the missionaries have thought like this, Things wouldn’t’ve Fallen Apart.